Happy Cinco de Mayo! Here’s a last-minute idea for your Cinco de Mayo celebration or one to pin/print for upcoming summer get-togethers, BBQ’s, light meal ideas etc. 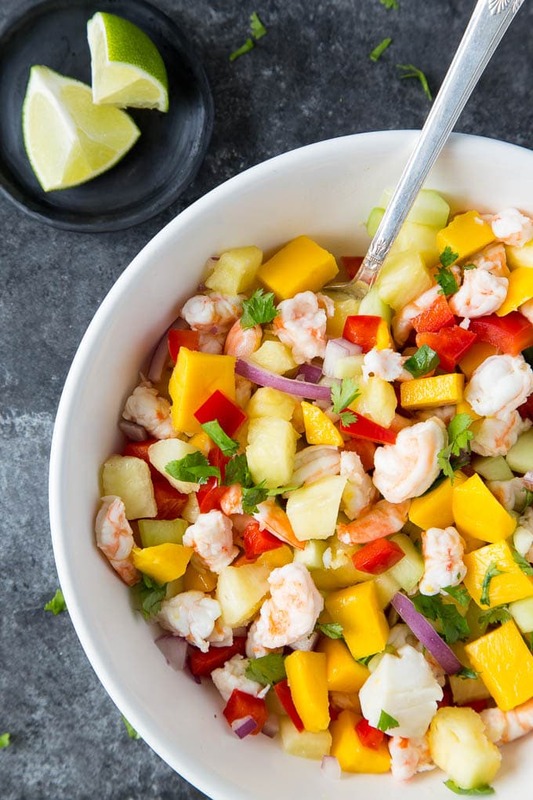 This Mango + Shrimp Ceviche comes together quite quickly ( about 35-45 minutes from start to finish) – the shrimp is cooked in boiling water for 1-2 minutes and then marinated in lime and pineapple juice for about 1/2 hour before being mixed with the mango, pineapple, bell pepper, avocado, onion and cilantro. 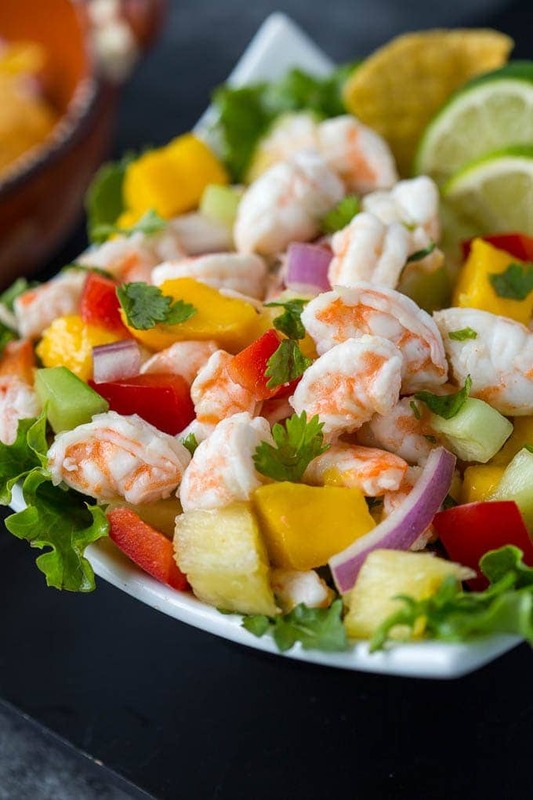 Many recipes for ceviche call for “cooking” the shrimp by allowing it to marinate in lime/lemon juice for several hours. This process is called ‘denaturation’ and it does “cook” the shrimp, however it doesn’t kill off any potential bacteria that might be on the shrimp. I’m not willing to take that chance so in this version I’m cooking the shrimp for just 1-2 minutes in boiling water prior to marinating it . This will eliminate any of those worries and not give up any of the tastiness of shrimp that has been soaking up lime flavor. By cooking the shrimp briefly prior to marinating it also means it’s not necessary to marinate for long periods of time ( just about 1/2 hour) bonus! 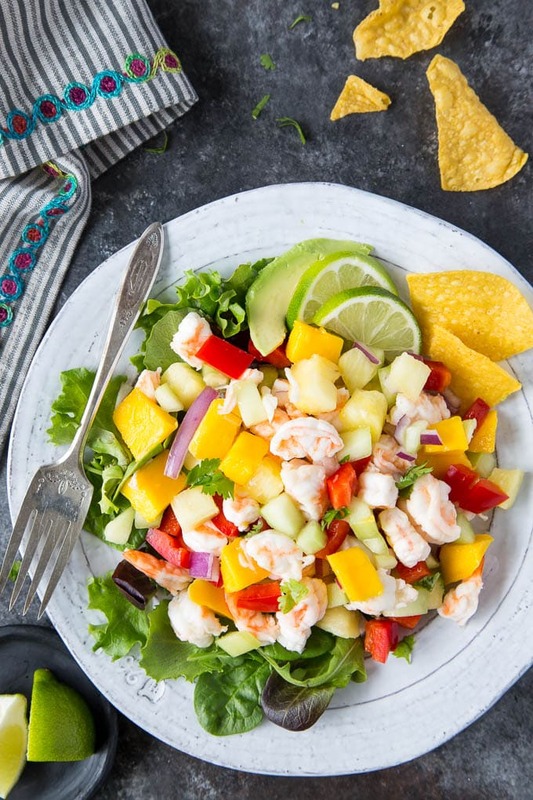 less time to wait to plunge a crispy tortilla chip into tropical shrimp/mango/pineapple ceviche. 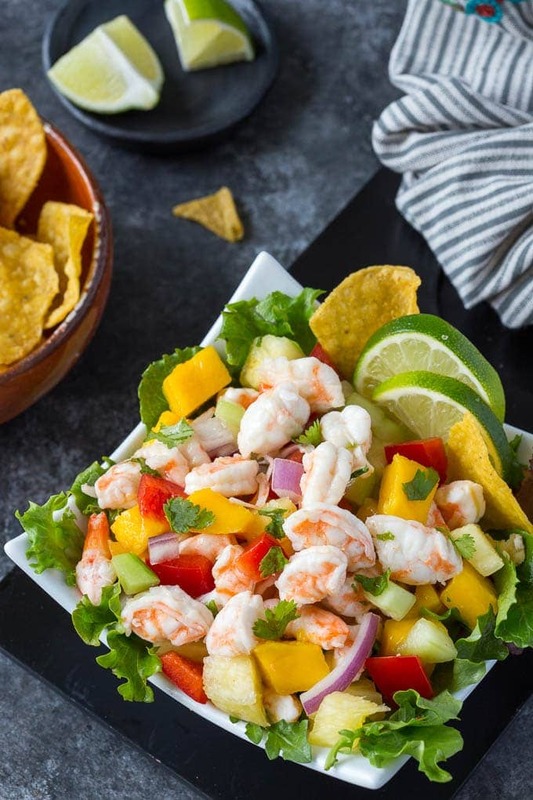 Mango + Shrimp Ceviche makes a great appetizer ( serve in individual bowls or martini/margarita glasses), a tasty “can’t stop eating” dip ( for tortilla chips or plantain chips) and a fresh and healthy light meal option ( serve over a bed of greens or rice). However you decide to serve it I’m sure you’re going to love this tasty dish! Bring a medium pot of generously salted water to a boil. Add shrimp and immediately turn off the heat. Let shrimp sit until just cooked through, about 1-2minutes. Drain and rinse under cold water. Chop shrimp into ½ inch pieces and transfer to a large glass or ceramic bowl. Mix in the lime and pineapple juice, onions and serrano chile (if using). Cover bowl and refrigerate for 30 min. Optional step: (if you prefer less acidity) drain lime/pineapple juice from the shrimp prior to mixing with remaining ingredients. Mix in bell pepper, pineapple, mango, avocado and cilantro. Salt and pepper to taste. Garnish with cilantro leaves, if desired. Serve over a bed of greens or in individual bowls or martini/margarita glasses with tortilla chips.